BMW shifted global production of the X3 to Spartanburg, South Carolina, from Graz, Austria, to reduce currency exposure and make the SUV more competitive in the United States. SPARTANBURG, South Carolina (Bloomberg) -- BMW AG, the world's largest maker of luxury cars, is revamping its X3 model to catch up with Volkswagen AG's Audi in the U.S. market for compact premium SUVs. The second-generation X3, which goes on sale in Europe in November and the United States in Jan. 22, will bulk up, adding more than 3 inches (76mm) in length and 1 inch (25mm) in width to take on the Audi Q5. At $3,650 below the current X3's sticker price of $38,850, the Audi model has an edge in pricing. The X3, which exploited a niche for compact, upscale SUVs when it was introduced in 2004, has since fallen behind. Nine-month U.S. deliveries of the Q5 jumped 78 percent to 16,636 vehicles, making it Audi's second-best seller in the country after the A4 sedan. The X3's nine-month U.S. sales dropped 1.2 percent to 5,036 as consumers wait for the new version. The overhauled X3, which will be offered with optional in-car Internet access, will carry a lower sticker price than its current version, said a person with knowledge of the matter. Pricing details will be released later today. Reviving sales of the compact SUV is part of BMW's push to overtake Toyota Motor Corp.'s Lexus in U.S. luxury-car sales. The German carmaker's U.S. sales rose 9.2 percent to 157,464 vehicles through September, while Audi jumped 24 percent. Lexus remained the U.S. leader with deliveries of 162,438. BMW shifted global production of the X3 to Spartanburg, South Carolina, from Graz, Austria, to reduce currency exposure and make the SUV more competitive in the United States, where Lexus has been the top-selling luxury brand since 2000. CEO Norbert Reithofer is keen to re-build U.S. operations after 2009 sales slumped 28 percent from the pre-crisis high of 335,840 vehicles. BMW is looking for “balanced” growth, and the United States is “very key” to these plans, Reithofer said in an interview last month. Reithofer, Frank-Peter Arndt, the board member in charge of production, and U.S. chief Jim O'Donnell are among BMW executives who will show the new X3 and discuss the carmaker's strategy at a press event in Spartanburg today. The maker of BMW, Mini, and Rolls-Royce autos is investing $750 million in the 16-year-old Spartanburg factory to accommodate the X3, which will join the X5 and X6 SUVs at the site. Following the completion of the expansion in 2012, capacity will rise to more than 200,000 vehicles a year from 160,000, making it the biggest BMW plant outside Europe. BMW exports vehicles produced in South Carolina to more than 120 countries, including its home market. BMW has invested $1 billion in its U.S. operations since 2008, including an expansion of the Spartanburg factory, new distribution facilities, and a $100 million North American headquarters in Woodcliff Lake, New Jersey. BMW also has a design unit, emissions testing, and technology lab in California as well as a financial subsidiary in Ohio. 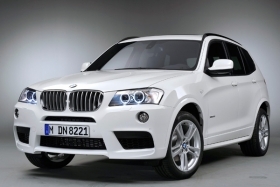 BMW will use the introduction of the X3 to renew a push for American drivers to custom build their vehicles. The effort will feature images of the customer's vehicle as it's produced. The video clips will be taken from seven stages of the production process and uploaded to a personalized Web site, said Kenn Sparks, a spokesman for BMW's U.S. operations. Moving production to Spartanburg makes the program possible because of shorter delivery times and a production process that allows buyers to make changes to the vehicle order as late as six days before the assembly date, said Sparks. Audi, the biggest profit generator for Volkswagen, is expanding the Q5 range in the U.S. by adding a fuel-efficient four-cylinder engine for the 2011 model year, and a hybrid version later in the year, said Esther Bahne, a spokeswoman for the VW unit. Inventory averaged 15 days for the Q5 compared with normal levels of 45 to 55 days, she said. Ingolstadt-based Audi is targeting U.S. deliveries of at least 100,000 this year, surpassing the 2007 record of 93,506 vehicles. The Q5 went on sale in the U.S. in March last year. The RX 350, Lexus's smallest SUV, starts at $37,625. Nine-month RX sales in the U.S. gained 4.4 percent to 67,896 vehicles. The battle for wealthy U.S. car buyers is getting tougher as the economy struggles to rebound from the worst recession since the 1930s. U.S. employers cut 95,000 jobs in September, keeping the unemployment rate at 9.6 percent. President Barack Obama is pushing to let tax cuts for high-earners expire at the end of the year, which could dampen luxury-car demand. New Lexus models will also likely keep the Japanese brand ahead of BMW for the foreseeable future. Lexus may expand its lead over the BMW brand to 41,000 vehicles in 2012 from 13,000 this year, according to IHS estimates. “The tax situation would hit BMW's clientele directly,” said Rebecca Lindland, an analyst with IHS Automotive in Lexington, Massachusetts. “The X3 could help, because it brings in a potentially younger buyer."